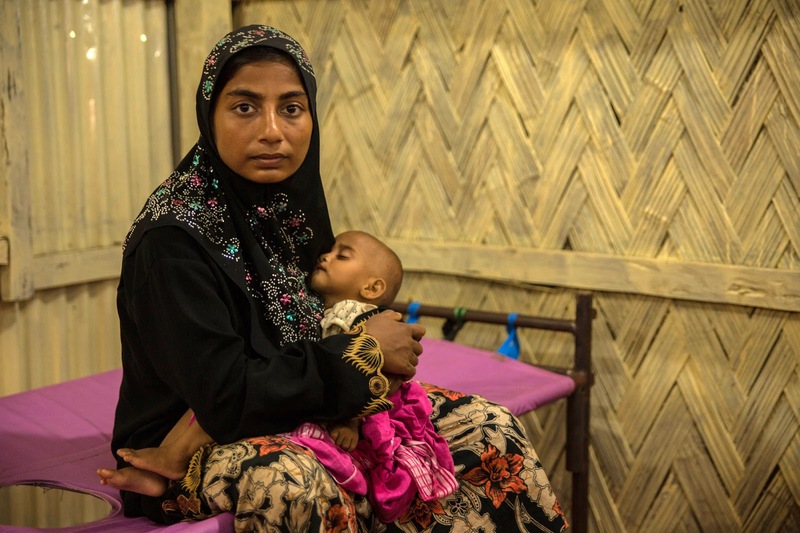 Rohingya refugee mother brings her child to a diarrhea treatment centre in Cox's Bazar. Rashedul Islam finds his passion of serving others at the refugee camp in Kutupalong, Cox’s Bazar. 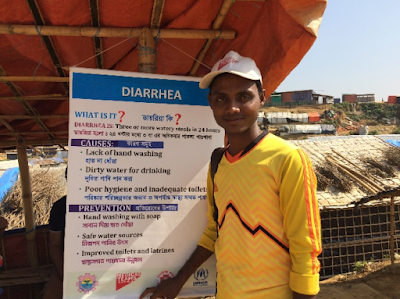 “Now, I have become confident that I can do something for my community,” said Rashedul Islam, twenty-one-year-old young Rohingya man working as a community health worker in Kutupalong, Cox’s Bazar. Rashedul helps educate refugees about health and sanitation to prevent diarrheal diseases. Food for the Hungry (FH) Bangladesh, in collaboration with Medical Team International (MTI), set up a Primary Health Care Center in Kutupalong, Cox’s Bazar on 13 October 2017. The centre provides immediate health assistance to the Rohingya refugees who fled Myanmar because of various kinds of discrimination and oppression. Rashedul is one of the half-million people who have recently fled Myanmar along with his wife. Their home is in Kiariparang Village, Maungdaw Township, where he was born. According to Rashedul, his ancestors lived there hundreds of years ago. He earned a living as a day labourer doing various jobs like working in rice fields, construction, and hauling supplies and equipment for others. On 29 August 2017, his quiet and peaceful life came to an end with the great explosion of a grenade as it struck a neighbor’s rooftop during the middle of the day. Rashedul remembered that hundreds of soldiers suddenly entered their village and began firing their weapons around their village. He witnessed the death of his loved ones, friends and extended family members, young and old. Rashedul and his wife fled their homeland in fear. They spent five days fleeing from Myanmar with little more than the clothes on their backs to reach the Naf River (physical divide between Myanmar and Bangladesh). Somehow, they managed to cross the river and came to the Kutupalong Rohingya Camp in Cox’s Bazar without knowing anything about the country or the people. Rashedul saw lots of Rohingya people who had faced the same brutality and oppression like him. It seemed there was a new struggle to him every day and every moment. He saw the unhygienic environment in the camp. No water, no latrines, no food. He couldn’t help but cry when he witnessed the awful situation. However, his family managed to survive with the food assistance of the Bangladesh Government and World Food Programme. Finally, an opportunity came to him when he saw the activities of the Primary Health Care Center. One day he went to there for emergency treatment. Rashedul’s ability to speak Bangla and read and write English and Burmese caught the attention of a nurse. Rashedul has an inherent spirit to teach others and help them understand. When the offer came to assist the healthcare cenre as a community health worker, he accepted with happiness. Rashedul felt that he would be able to serve the people from his country. He feels blessed by this opportunity. At the initial stage, he received training by MTI staff members on health materials and on how to disseminate health information. He is now confident enough to approach the Rohingya refugees and teach them about health and hygiene. At Kutupalong, the water is contaminated. Combined with high population density, the outbreak of acute diarrhea is very likely. Therefore, Rashedul used this as an opportunity to educate his people on clean and safe water practices, especially water purifying process that uses tablets. In addition to educating others, he also sits at one of the Oral Rehydration Points where he distributes water purifying tablets and hand washing soap, which contains antibiotic properties, and oral saline. He goes “door-to-door” in his zone and spreads awareness on health and hygiene issues. In the case of an emergency, he provides referral services to patients and follows up on their treatment for acute care. Rashedul feels passionate about his work because he knows he is making a difference in the lives of his Rohingya people.